The Mexican holiday Dia de los Muertos (Day of the Dead) is about honoring those who have passed on - every year, I take a moment on this day to remember the Southern Residents we have lost in the previous year. You can see the whole series of blog posts here. Over the years these posts have gotten harder to write, as the population continues to decline. But now more than ever, as we continue to fight for the survival and recovery of the Southern Residents, it's important not to forget the stories of the whales we have lost along the way. We all knew we would lose this great matriarch one day, but that didn't make it any easier when the day finally came. 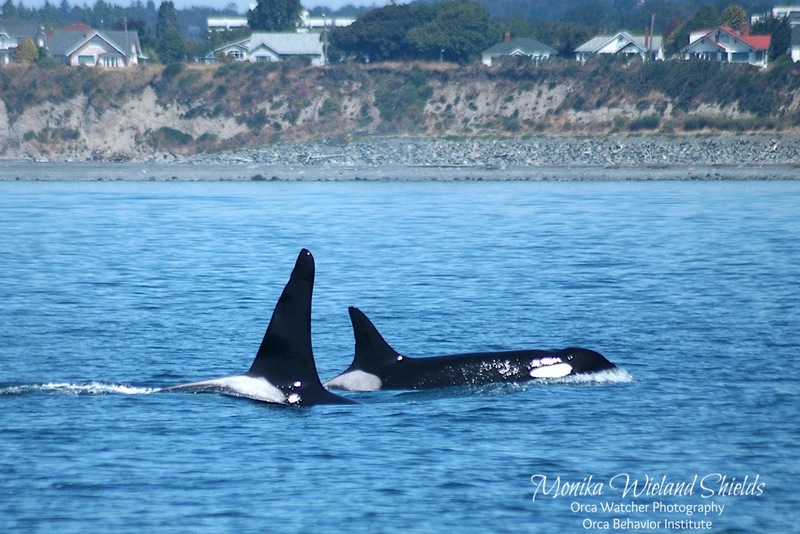 The oldest living Southern Resident Killer Whale, Granny's estimated birth year was 1911. While we will never know her exact age, we do know she lived through all the major changes the Southern Residents have experienced in the last many decades, including the live capture era, the commercial fishing boom, the rise of whale-watching, and the crash of Chinook salmon. Of all the whales, how I most wished I could have a conversation with Granny. Granny was a leader in a the true sense of the word. We suspect she held and shared important communal knowledge for the Southern Residents, such as where to travel and forage in different times of year and different seasonal conditions. 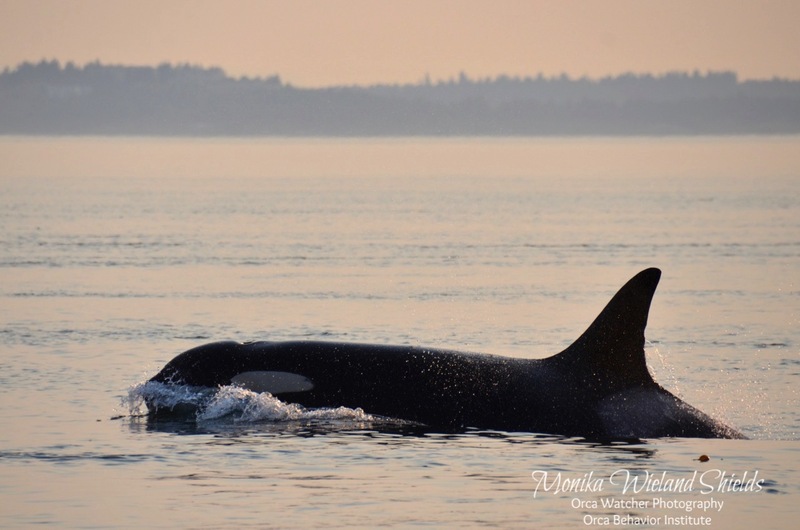 We know she was often out in front, literally leading the way as her pod traveled from place to place. It wasn't uncommon to see Granny a mile or even several miles ahead of everyone else as they went up and down Haro Strait. While at times she seemed to be "all business", other times she definitely showed that even an old gal can "kick up her heels" and play, too. For many years Granny's most constant travel companion was J1 Ruffles. The two were so close, it was assumed they were mother and son. 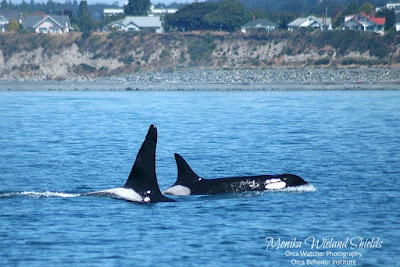 Genetics have indicated this may not be the real story; it begs the question what kind of relationship they had, and if J1 wasn't finding in Granny something similar to what the orphaned L87 Onyx would find from her years later. Granny regularly associated with many different whales. 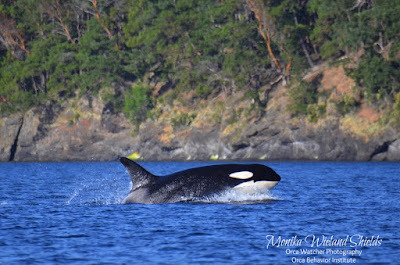 Whenever whales from outside of J-Pod would travel with Js for a period of days or weeks, it was often Granny's group they were associated with. Granny wasn't only an important whale in her whale community, she was an important whale among the human world as well, including to me personally. She was the first whale I saw swimming through the kelp at Lime Kiln, an image forever etched into my memory. She was the whale I chose to get tattooed on my arm, and the one I painted a mural of on my family's houseboat. 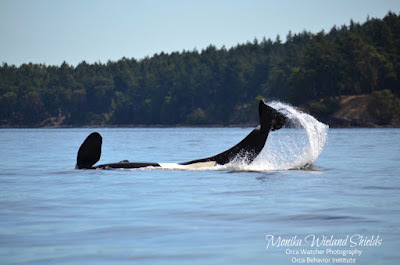 When we bought our boat and had our first-ever Southern Resident encounter, she was the one who came out of no where and circled around us, giving us what felt like a proper "christening". Even after another full season has passed, it still feels bizarre to see J-Pod without Granny. It will likely take years for us to see what the result of her passing might be, if we will ever know. One thing we can say is that she lived a long life, and we can only hope her descendants get a chance to do the same. Just like the loss of J14 Samish last year, the death of K13 Skagit really came as a surprise to me. 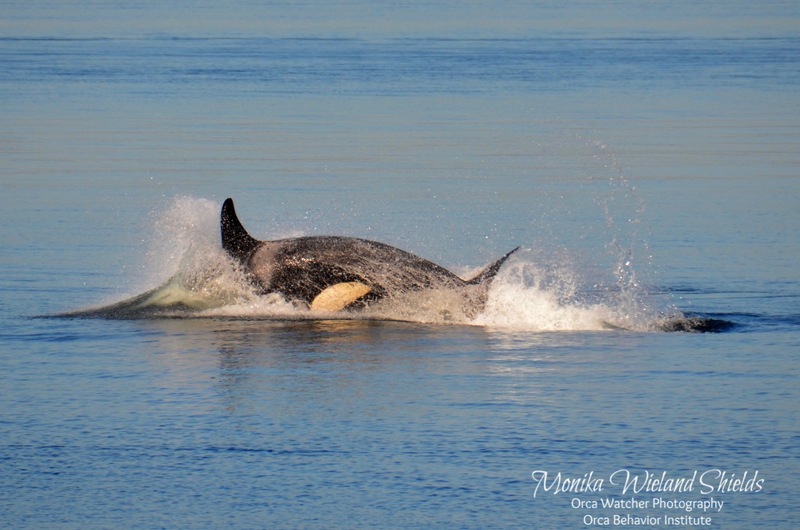 She was another productive mother just as the end of her reproductive years, who had the potential to enter to the matriarch role for her pod, and then, out of no where - gone. Because K-Pod was so scarce in inland waters this year, it took a while before we knew for sure if she was gone or not. I held out hope as long as I could, but when her whole family came by Lime Kiln without her, there was no mistaking her loss. Having been born in 1972, Skagit likely just narrowly escaped being taken into captivity for the marine aquarium industry. Instead she went on to become a mother of two sons and two daughters, and also lived to see the birth of her first two grandsons. 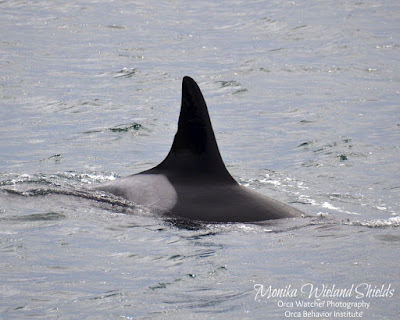 While her daughters are past due to give birth to their second calves, I had really hoped Skagit would be around to see her family and her pod grow. 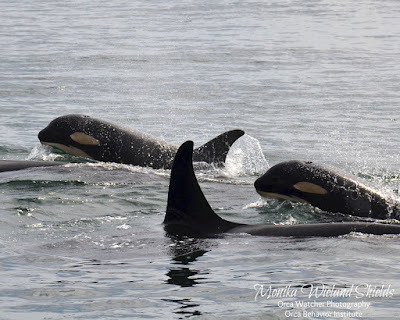 I'm anthropomorphizing here, but with Skagit's loss I was most worried about her older son, K25 Scoter, who has always been such a mama's boy. 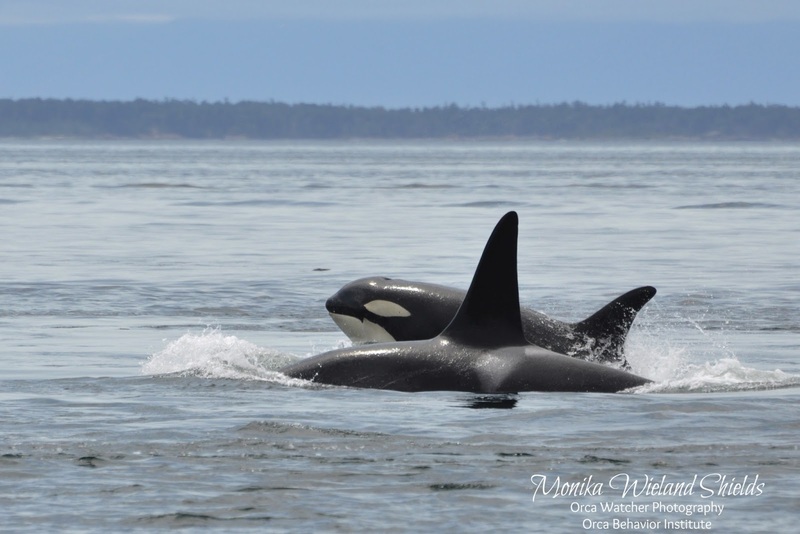 He was rarely more than a few body lengths away from her in recent years, and we know that the likelihood of survival for males goes way down after the loss of their mothers. It was good to see Scoter this summer, and according to the photogrammetry research team he was looking pretty plump, but it must be a hard adjustment for all the remaining K13s. I wonder if Skagit's loss had anything to do with the fact K-Pod was barely around this year? Will their travel patterns completely change without her? 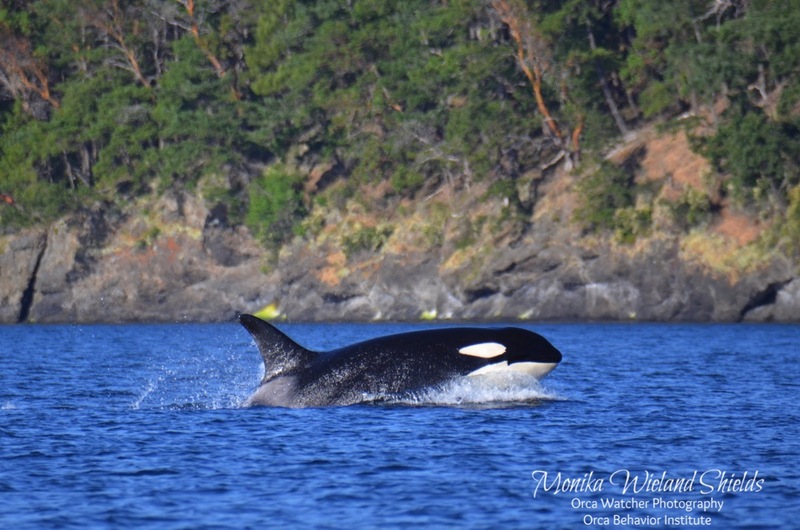 Sonic was the first-born calf to J36 Alki and part of the amazing stretch of births that occurred between December 2014 and January 2016. Sadly, in recent months he became the latest "baby boom" calf not to make it, bringing us down to just five survivors among the ten known births during that time. To me, it felt like his birth was the one that made it a baby boom. We had J50 and J51 after nearly 3 years with no live births, and then within the same 3 month span J52 was born and I remember my reaction was one of disbelief: "No way....another one?!" His arrival was especially hopeful because he came to a young first-time mom. 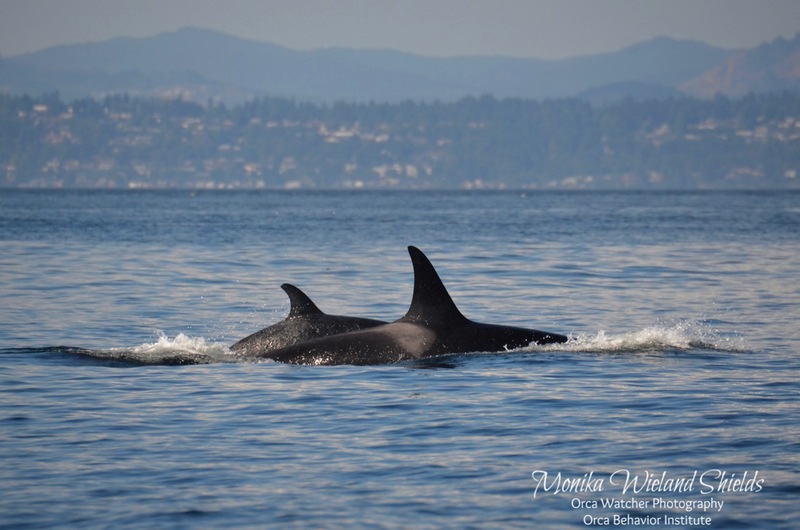 So many young females that should and could be having calves are not, and it was reassuring to see Alki have her first calf at a "normal" age. 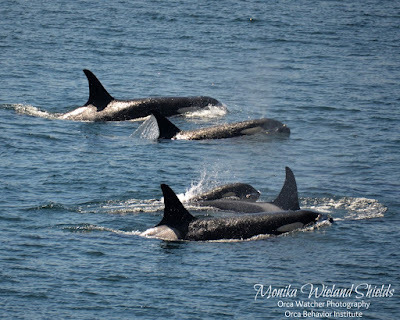 Sonic was a spunky little whale, and he regularly found willing playmates not only in his mom, but in his sisters J42 Echo (who liked to babysit him) and J50 Scarlet, who was just a few months older than him. His faint saddle patch was just visible enough to see that it was an open check-mark shape like several of his other family members, and I had been excited to see what it might look like as he grew older. Sonic's decline was pretty rapid. In my last few encounters with him he looked okay, but the photogrammetry team documented him with peanut head in September and the Center for Whale Research has a final encounter with him where he was very lethargic and clearly malnourished. His mom Alki had looked skinny in the spring of 2016 (not totally unusual for a nursing mom) but recovered, and I was thankful at least that the photogrammetry team thought she looked "okay" this fall. The fact that he was so thin and she wasn't makes me wonder if a disease or something played a complicating role in his demise. 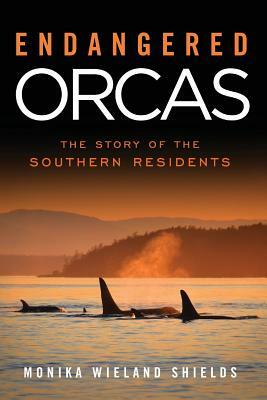 As with most orca deaths, we will never know for sure. What I do know for sure is that the J16s won't be the same without him. When will the next birth happen? 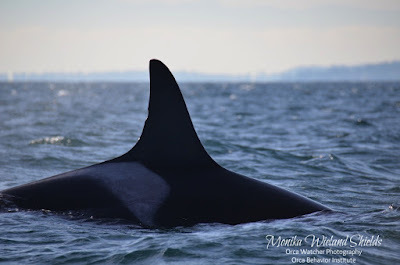 Usually in these blog posts I also take a moment to acknowledge the new whales that have joined us, but there are no new Southern Residents to welcome this year. After the birth of J49 in 2012, we went over 2 years before another live calf was seen, and over 3 years until the next calf survived. We had the baby boom from the end of 2015 through 2016, but again we're coming up on 2 years without a live calf seen. Meanwhile the population has dropped to just 76 whales, a 30 year low. The situation is dire. The silver lining, if there is one, is that the state of emergency the Southern Residents are in is beginning to be acknowledged on both sides of the border. In October, the federal government of Canada held a workshop to assess actions to be taken on behalf of the Southern Residents. The San Juan County Marine Resources Committee also held a workshop to brainstorm immediate actions that can be taken at the County level. Two days later we had our 5th CALF (Community Action - Look Forward) workshop, also focusing on citizen actions to help the whales. Washington Governor Jay Inslee has indicated his concern, and willingness to take unprecedented action. 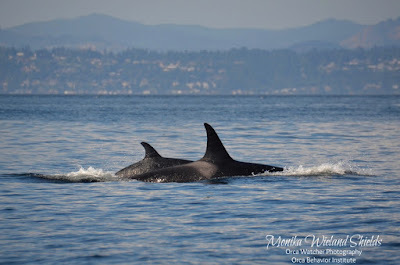 The first action to come out of all this was Canada adopting at 200 meter vessel rule to match the 200 yard limit in the US; additionally the Canadian government promised lots of funds towards continued ocean noise monitoring. While dealing with vessel noise may help the whales hunt more efficiently, the fact is that even silencing our oceans entirely won't give the whales enough fish to eat. If the Southern Residents are going to have a fighting chance, major actions need to be taken to address Chinook salmon recovery. It remains to be seen is what concrete actions will be taken regarding salmon. Yesterday, the Puget Sound Partnership passed a resolution to accelerate Chinook salmon recovery efforts on behalf of the whales. Let's hope this is just the first of many such efforts in the coming months. Meanwhile, the whales continue on, and so must we. 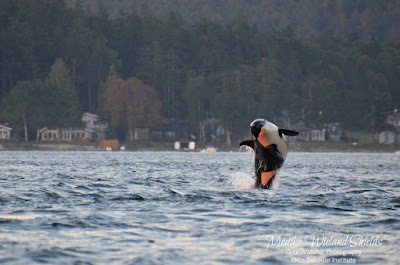 The writing of this blog post was delayed by the unexpected appearance of the Southern Residents in Haro Strait this evening. After hearing them on the Lime Kiln hydrophones, I went out to the west side. 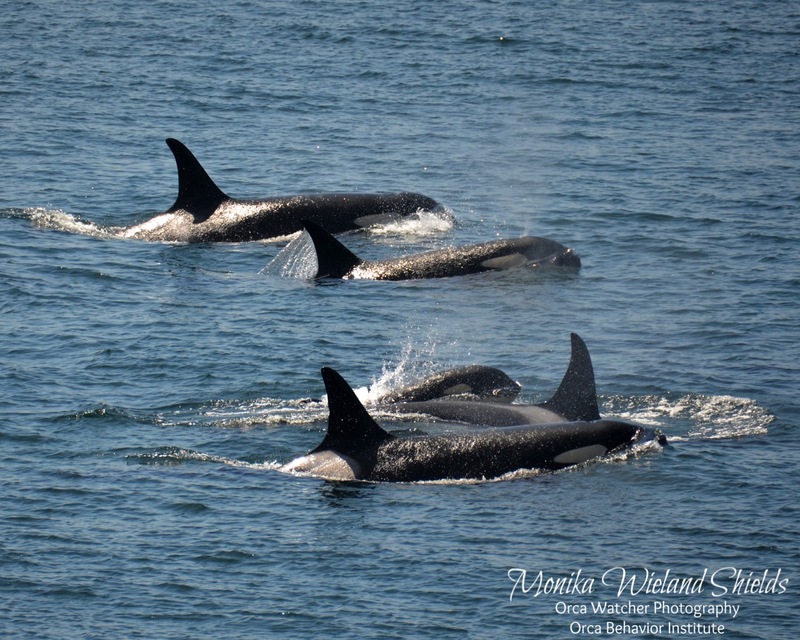 Even though they were several miles offshore, it was obvious they were in party mode, as there were breaches and tail slaps galore. When it got too dark to see, I came home and am still hearing all three pods (and many more percussives) on the hydrophones right now as I finish this post. We didn't have a true superpod all summer, where the entire Southern Resident community was together, but I wouldn't be surprised, with all the crazy vocals and surface activity, the first Salish Sea superpod of 2017 is underway today. 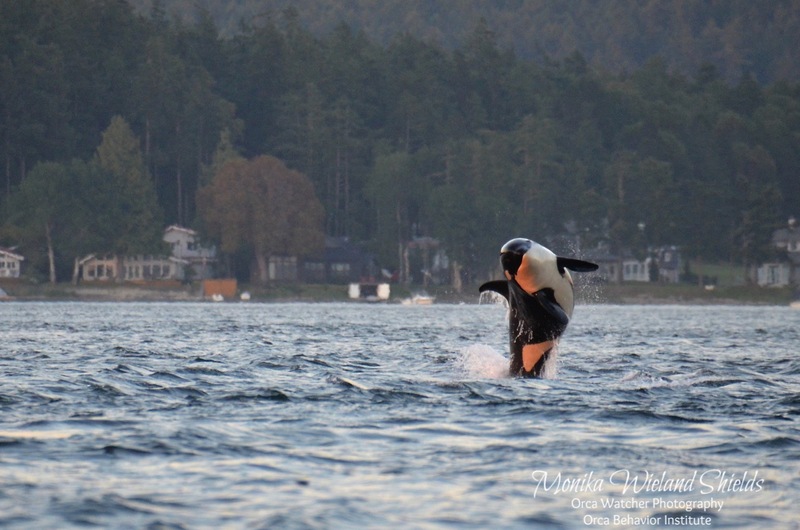 Day of the Dead isn't part of Southern Resident Killer Whale culture, but how fitting if today they too are coming together in celebration. It never ceases to amaze me that despite their losses, they still carry on and clearly still know how to have a good time. I have no doubt they remember their ancestors, and here's hoping some new calves are being conceived among all that partying tonight! Very sad, well written. We were visiting San Juan a few months ago and saw none of these creatures this time. Hope they can mount a successful comeback.